I have the worst timing. Last year I released Sand In My Shoes, a sunny, beachy album around the time of the Gulf Oil Spill, when no one was going to the beach! This year I’ve been working on the Rainmaker project again because we’re in a severe drought, but the same anomalous weather conditions that have caused an unprecidented drought here have caused massive flooding elsewhere. While we’re—figurative speaking—“dying” down here, people are literally dying elsewhere. The most recent episode in the rampant freak weather is the tornado that hit Joplin, Missouri. I’ve been to Joplin, went through there on a family vacation when I was a kid. It was sunny, people were friendly. Now there’s a dark could over Joplin and some of the friendly people have been killed, injured, and lost everything. I can’t stop the disasterous weather. I can’t change it, no matter how many rain tracks I listen to. The storm I was waiting for passed over us dropping only a light rain, not even enough to measure, though parts of Houston got more. I’m giving myself one more week to produce another rain track, then hurricane season will be upon us. I’ll not tempt fate after that. This same “bubble” that’s not allowing rain to reach us will push hurricanes away, too, but with the freakish weather I expect it won’t last and we could go from drought to flood. I have many times urged you to give to the Red Cross. People need help. You can’t control the weather. Most of you can’t be there, in person, doing disaster relief work in areas which have been hit by floods, tornados (or hurricanes, tsunamis, earthquakes, etc) but you can support the people who do this good work and support the people who have lost their homes—and to a great extent their lives—by giving to the Red Cross. It’s the best organization for providing rapid response with food, water, and shelter when a disaster hits. And lest you fall prey to “disaster fatigue” because it seems like something terrible is always happening somewhere, remember that someday it could be you who’s getting wrapped up in a blanket by a Red Cross worker. Even if you don’t live in “tornado alley” or near a flood-prone river, or on an earthquake faultline—even if you live in the dullest, safest place on earth—you could still find yourself personally grateful to the Red Cross. A friend of mine, in my hometown, once mentioned that when a neighbor’s house burned down the Red Cross turned up immediately to help them. When you see apartment fires on the evening news do you ever wonder what happens to all those people who are standing there sobbing and shaking in the middle of the night with nothing but the clothes on their backs? The Red Cross—that’s what happens to them. There are other organizations that help, too, many of which are faith-based non-profits, but these vary from community to community (and if it’s a community-wide disaster they’ll be hit as hard as everyone else). The Red Cross is everywhere. They’ve been doing disaster relief longer than anyone else and they’re damn good at it. 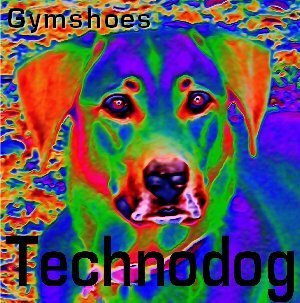 My big dog, who was well-known to all of you as the dog in the “Technodog” artwork (though not the dog on the track), was put to sleep this morning after a brief, but agonizing, illness. We got no sleep last night, but now she is sleeping eternally and I am grieving eternally. She was a wonderful, remarkable dog. The flooding in the midwest this summer is being compared to the inundation of Hurricane Katrina. Many people have lost their homes and livihoods, farmers have lost crops, the devastation is widespread and catastrophic. The American Red Cross is on the scene, but doesn’t have the resources to adequately cover something of this magnitude. As with Hurricane Katrina, they desperately need donations. They are facing a short-fall of 35 million dollars. Please give to the American Red Cross, so that they can give to those who need their help so urgently right now. Thanks. Posted in Musing | Comments Off on Happy Holidays!